"BOSCH 3/8 RIGHT ANGLE DRILL3.8 amps, 0-1100 RPM. Easy to actuate paddle type switch. Low profile design for drilling in close quarters. Variable speed dial for matching speed to the application. Standard Equipment: chuck, chuck key." I got this drill because I needed to drill into a very tight space, and this drill had the short clearance I needed. It works great for drilling or screwing things down in tight spaces. That's what it was designed for. It is not a heavy duty drill. The metallic head, which contains the right angled gearbox, gets hot if you drill continuously for long periods. When my general purpose Black and Decker drill broke one day, I started using this drill for a bunch of stuff, like sanding and grinding, as well as drilling, and boy, did the gearbox get hot, almost too hot to touch. The paddle trigger is also not one of my favorites. Even now, it still feels awkward. The trigger was designed for safety, not functionality. To keep you from accidentally starting the drill, you have to push/slide the paddle downward before it will unlock and depress and start the drill. All I can say is that this mechanism sure works great at making it difficult to start the drill, whether accidentally or deliberately!!! There is a knob to adjust the maximum speed of the drill, which is a nice feature to keep you from accidentally overdrilling/overscrewing something. Especially since the paddle trigger is a bit hard to use, it helps to set a limit on the maximum speed that you start off with. As a tool for fine craftwork, well, it's a bit too heavy for fine detail work - you need big hands to grip the thing comfortably. A Dremel tool it's not. 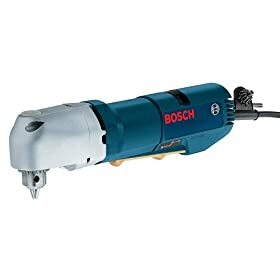 For heavier duty projects, I find that my RotoZip high speed drill works better because it's lighter and more maneuverable than this Bosch drill, and faster and more powerful at cutting and trimming larger projects. But, if you need a drill for tight spaces, this one works just fine. I already had a Milwaukee 3/8in close quater drill that workes very well. I got this because I wanted it, not needed it. It seems a step up in quality from the Milwaukee, and was 25 bucks more. Worth it. If I had to do it all over again, I would only have the Bosch. Bought bosch to replace dewalt dw-160 that I got on clearance when hechinger went out. Oddly enough bosch was bought when woodworker's world went out of business. The Dewalt was horrible, it had single speed(1200rpm) and no reverse!!!!! I love that the bosch has reverse and a variable speed dial. The speed dial makes it easier to drive screws. I am not to fond of the paddle switch, but I give it 5 stars anyway because I like the slower speed(1100rpm) and speed dial. I used this drill for an entire weekend, drilling holes for electrical wires in a large home addition. It performed flawlessly. Most of the holes were 7/8 inch (using a spade type bit), and this drilled handled it fine. The on/off trigger takes some time to get used; you have to pull down then in to operate the switch, but a great safety feature. I have used other right handle drills that didn't have this and I ended up with banged up knuckles. This is a great little drill, with powerful performance, and excellent quality. I also have a Milwaukee close quater drill. This one is a lot more robust in construction. It also has a metal encased gearbox, which should be very druable. The on/off switch could be a little easier to operate, but I think Bosch designed it this way with safety in mind. Overall, a quality product. I purchased this drill for a basement remodel. Will be drilling between studs for wiring, etc. It is a solid drill. I read the reviews about the paddle switch and was a little apprehensive when purchasing without being able to hold it in my hands and try it first. Well, I am happy to say that it feels and works fine. I personally don't see what the problem is with the switch. I have no problem activating it and feel that the safety issue far outweights any undesirable design. I checked them all prior to making a purchase. The pricewas a bit excessive, but this was a clear choice and the quality is unrivaled. The switch does take a little getting used to, but not a big deal.